House of Representatives Speaker Nancy Pelosi and other Democratic leaders released a statement on Monday condemning the tweets and calling on Ms Omar to “immediately apologise for these hurtful comments”. “Legitimate criticism of Israel’s policies is protected by the values of free speech and democratic debate that the United States and Israel share. The statement was also signed by Majority Leader Steny Hoyer, Democratic Caucus Chair Hakeem Jeffries and vice-chair Katherine Clark, Majority Whip James Clyburn, and Assistant House Speaker Ben Ray Lujan. Mrs Pelosi also indicated she had spoken t Ms Omar about the controversy. 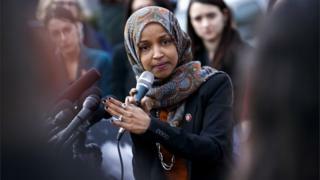 Max Rose, a New York Democrat, called Ms Omar’s remarks “deeply hurtful”. The letter did not name Ms Omar, but said top Democrats must confront lawmakers who make “reckless statements”.